When I was putting this gift guide together I realized I could go on and on. Men seem to be tough for but I enjoy finding things that they may want or most likely need. Some men in my life always have an idea of what they want and some have zero idea. For those that seem to have everything or want nothing, I like to get them something personalized or maybe a piece of art. We live in a fast pace world and if the man in your life isn’t a runner at the very least he will where sneaker to get from point A to point B. Most runners have a specific sneaker that fits their foot the best but these APL sneakers have a very cool and sleek look to them that any male would love to wear just because. Hats are a great gift. You don’t need to worry about what size they need and it will be put to good use. It’s safe to say we all find it annoying when we need to use our phone in the winter and we have to take our glove off to use it. They do make tech friendly gloves like this pair here which I love. Sometimes there is more than just using your phone when out and about. These fingerless gloves will allow you to easily zip your coat or grab your wallet. Men need bags. They don’t carry purses but there is always a situation where they will need to carry more than just their phone and wallet and its handy to have a backpack. Tie Bars are another thing every male should own. They don’t need to wear a tie bar everyday to work but for weddings or evenings that call for suits a tie bar definitely puts a finishing touch that is very polished. This set of three has great colors you can buy them individually and in different metals and textures. This tie bar has a sleek color with texture at the end. Something about bugs I just love and this bee tie bar is the coolest. I actually might need to put this in my husbands stocking! It’s a really good price too, you can find lapel pins over $100! For the designer lover. Trust me, I know this is an extravagant gift but I wanted to add one luxurious item for fun. 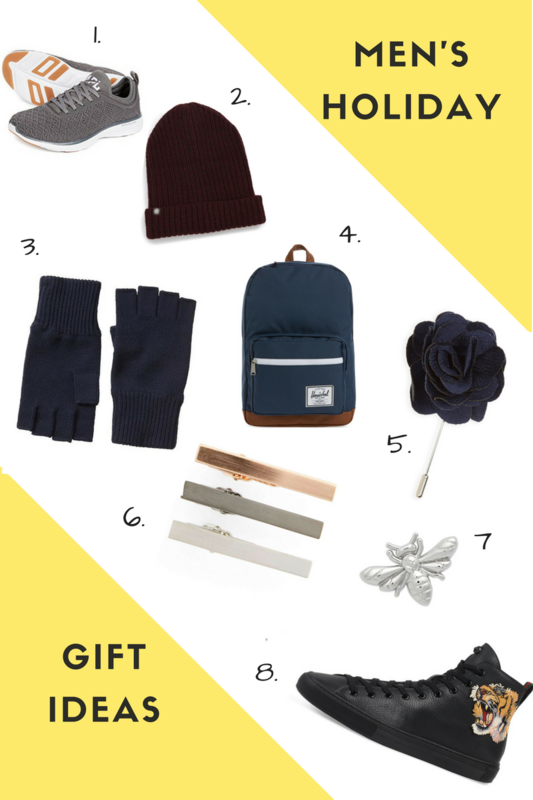 If you missed it, you can read my ladies gift guide here.